The infusion set is an important part of the pump. Infusion sets should only be used once and usually need to be changed within 2 or 3 days. Infusion sets are the parts of an insulin pump that go on to, and into, the body. 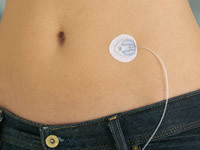 Infusion sets are used in insulin therapy. There are a number of different infusion sets available, including offering the use of needles or cannulas, different lengths of tubing and different ways of being attached to the body. Some infusion sets have a steel needle, which is inserted under the skin, and others have a plastic cannula. Plastic cannulas are flexible, to some extent, and may be more comfortable to wear therefore than steel needles. However, cannulas can sometimes kink causing problems with insulin delivery. Whilst cannulas can kink occasionally, they are popular amongst pump users. There is always the option to change infusion sets, from one that has a needle to a cannula or vice versa, if you wish to. The needle or cannula commonly varies between about 6 to 9 mm in length. Shorter needle or cannula lengths are more suitable for people with less body fat, larger lengths are more suitable for people with more body fat. Infusion sets can have the cannula facing directly towards the skin’s surface or at an angle (commonly between 10 and 45 degrees) to the skin’s surface. Angled infusion sets can be useful for people with less body fat. The adhesive is needed to keep the infusion set stuck to your skin. Some people may find they are more prone to having the adhesive wear away, typically if the skin gets sweaty or wet, say from showering, sport or during hot weather. There are a number of different adhesives available which provide a stronger bond with the skin if needed. The quick disconnection device allows the user to temporarily disconnect the pump and tubing, say for showering, without needing to take out the entire infusion set. Some infusion sets detach but leave a small length of tubing still attached. This known as “away from site” disconnection. Insulin pump tubing is often available in different lengths. Typical tubing lengths are 30cm, 60cm, 80cm, 110cm. Infusion sets are usually changed every 2 or 3 days. If infusion sets are left in longer, there’s a higher risk that infections could occur under the skin or occlusions (blockages in the cannula) could occur. The best infusion sites, the parts of your body you attach the infusion set to, are parts of the body with a good layer of fat under the skin. Good places tend to be the abdomen, thighs, buttocks, hips, upper arms and either side of the lower back. People with less body fat may find they have less choice of infusion sites but it should be possible to use a number of different areas to attach your infusion set. It’s important to make sure you do not regularly re-use the same infusion site as this can lead to the subcutaneous tissue (fatty tissue just under the skin) becoming harder (lipohypertrophy), which can lead to inconsistent absorption of insulin and could therefore result in unexpectedly high or low blood sugar levels. It’s important that the infusion site is clean before attaching the infusion set. Some people may wish to use skin preps to help reduce skin irritation or to help the adhesive on the infusion set hold better. You can also get tape removers which help to make removing the adhesive easier when it comes to removing an old infusion set. Some infusion sets will offer both options whereas other infusion sets may only be attached manually. The insertion device you use will be one that is specifically meant for use with your infusion set. Insertion devices can be helpful as they allow the cannula to be inserted quickly and efficiently, and help you to attach the infusion set consistently each time. Insertion devices are popular but some people may still prefer to insert their set manually. Some insulin pumps need particular infusion sets to be used with the pump whereas other pumps are designed to work with a wider range of infusion sets. Check your pump manual to see which infusion sets can be used with your pump. Pumps that are compatible with infusion sets with a Luer lock offer more flexibility of choice over which infusion set you wish to use. Many infusion sets come made for specific insulin pumps. The following are the most common in the UK. Roche Accu-Chek infusion sets are for use with the Combo meter and Spirit pump. These include the Rapid-D, the Tenderlink and the Flexlink. Each is compatible with Luer-lock pumps. The Rapid-D is one of the flattest possible infusion sets when on the body at only 2.7mm. The disconnect point (for taking off the tube, but not taking out the set) is such that it disconnects away from the set, allowing for the set to be placed in a less accessible site (and you don’t have to access the site to disconnect). The Tenderlink is best for those with a thin layer of fat under their skin, or for pregnant women. Medtronic MiniMed infusion sets go with the Veo and Paradigm pumps. As one of the original suppliers in the pump sector, the Medtronic range of insulin sets is comprehensive. There is the Quick-Set, the Silhouette, the Polyfin, the Easy-Set and Soft-Set. The Polyfin has hypoallergenic tape so it is suitable for people with skin allergies. The Easy-Set is useful for children – it has two points that adhere to the skin, so accidental pulling-out of the set is minimised. Lifescan Animas infusion sets go with the Animas pump. These are the Inset range the Inset 30 and Inset II both come in 3 colours (pink, blue and grey – they can match your pump) and have a unique all-in-one inserter. They allow for being inserted by using just one hand and once done the inserter can be discarded. Orbit infusion sets from ICU Medical Europe have a low-profile dome shape (less snagging), blue tubing (makes air bubbles easier to see) and uses the standard universal Luer lock. Adhesive tape does not leave sticky tape residue on the skin. Available are the Orbit90 and the Orbit Micro, both of which rotate 360-degrees and require low dexterity to connect (aiding choice of sites as well as over all usability). The Cleo 90, Superline ST and Soft-Release O from Advanced Theraputics and are for use with the Dana Diabecare R pump. The Cleo (manufactured by Smiths Medical) is compatible with Luer-lock pumps, is easy to insert and the design of the insertion set is such that there is no possible injuries from sharps.